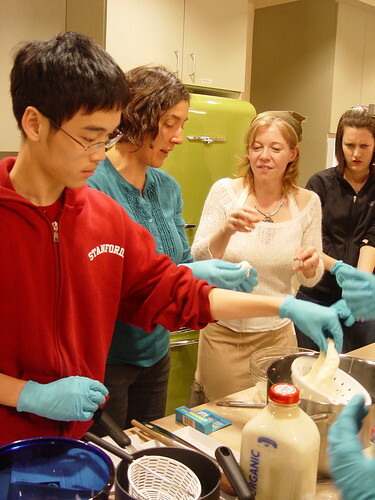 For my nephew’s birthday, I got him a Davis Co-op cooking class about how to make mozzarella! He’s a bit of a foodie so I knew he’d enjoy it. First, our teacher, Sacha Laurin, gave a disclaimer that while mozzarella is the fastest cheese to make (we’d be making two batches – once as a demo that we would all eat and then again in smaller groups to have a few pieces to take home), she hasn’t been able to make any that taste as good as store-bought fresh mozzarella. She said that most mozzarella is made from water buffalo milk, which has a higher fat content than cow’s milk, and perhaps that’s partly why. She also warned us that we wouldn’t be making very much to take home, so that the amount we made might be kind of disappointing. 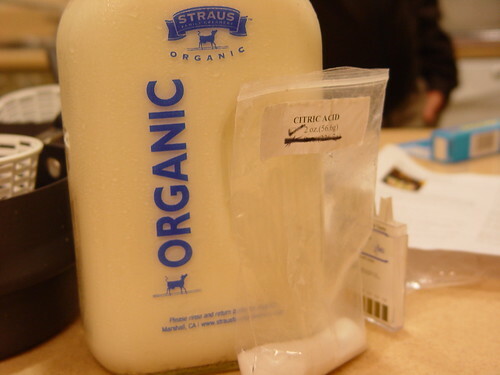 First, you MUST use Straus Organic Whole Milk (or raw whole milk). She said that she’d tried every other kind of milk and nothing else was worth it (not even Clover Organic). So right away, making mozzarella is a bit of an expensive enterprise. 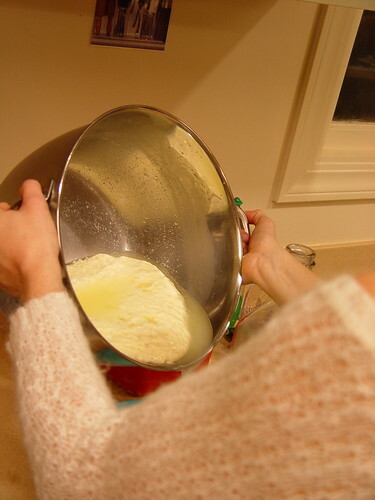 After breaking up the cream top with the milk in a large bowl, you dissolve 1.5 teaspoons (per gallon of milk) of citric acid powder (which can be bought in the bulk food section of the Co-op) in 1/4 cup water, then add it to the milk and stir vigorously. Now you heat the milk to 90 degrees F (instant-read thermometer is essential). It’s probably best to turn the heat off when the temperature is 89-ish. Vegetable rennet drops can also be bought at the Co-op (you have to ask for it at the cheese counter, for now). 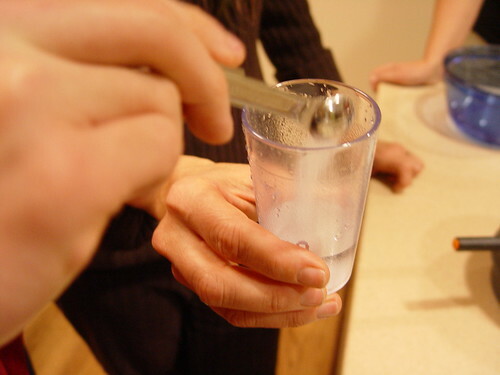 Add 45 drops to a small amount of cool, non-chlorinated water. Slowly stir in the rennet solution for about 30 seconds. 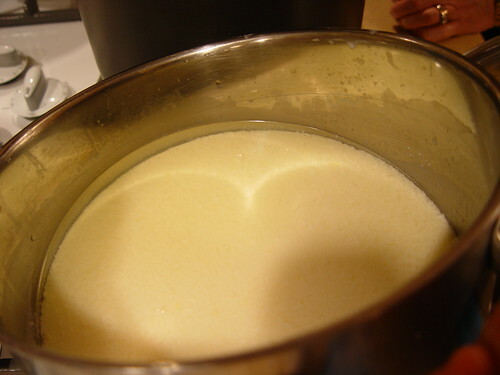 You might see curds starting to separate earlier, at which point you should stop. 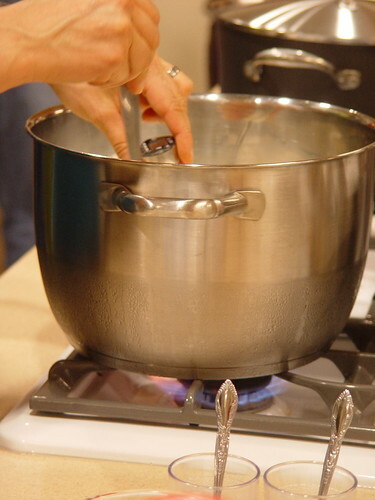 Leave the pot undisturbed for 5-10 minutes (you can cover it). 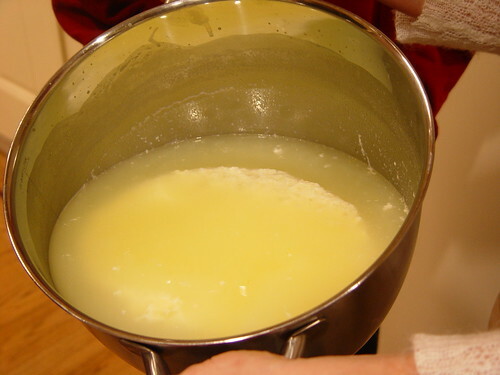 The curd will look like custard, with a clear separation between the curd and the whey (see above for what it looked like when it was just sitting in the pot, and below for what it looked like when we tilted the pot). If necessary, let it set for a few more minutes. 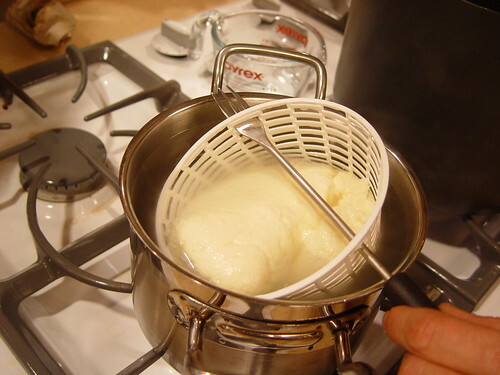 Gently tip the drained mozzarella into a small colander. 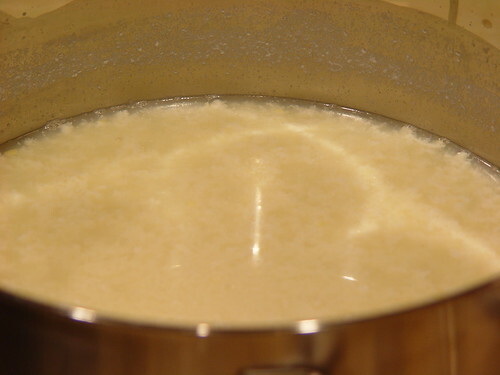 You should have a large pot of water simmering at 185 degrees F. Dip the curds (in the colander) into the water and keep taking its temperature. When the curd temperature reaches 135 degrees, it will become stretchable. See? 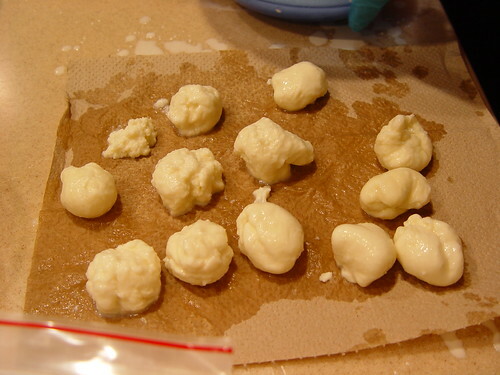 At that point, remove the curd from the water, don plastic gloves (to protect yourself from the heat), and pull off little balls. 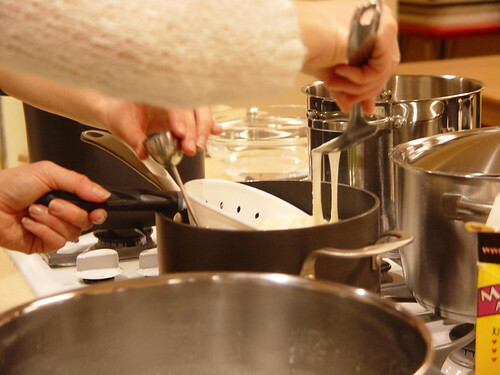 Working quickly (the more you work the cheese, the tougher it will become), roll the cheese in your palms or turn/fold it like you’re shaping a bread round (tucking in the edges) to get a smooth, shiny ball of mozzarella. 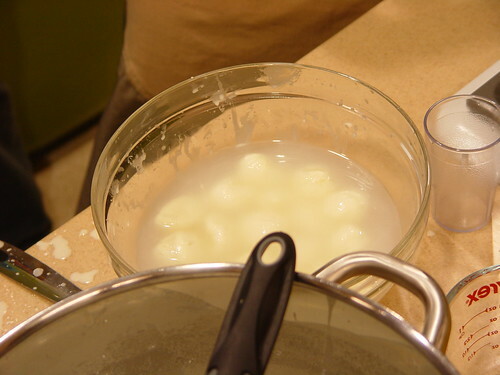 Drop it into brine (2 tsp salt to 1 pint of water) and keep making little mozzarella balls. Leave it for 10 minutes, which will cool the cheese and allow it to maintain its shape, then eat! After rescuing our mozzarella from the brine, some of them were distinctly softer and lumpier than others. The softer ones tasted better because they absorbed more of the brine, while the smoother ones were harder, less flavorful, but closer to “normal” mozzarella texture. They probably got worked a bit more than the lumpy ones. 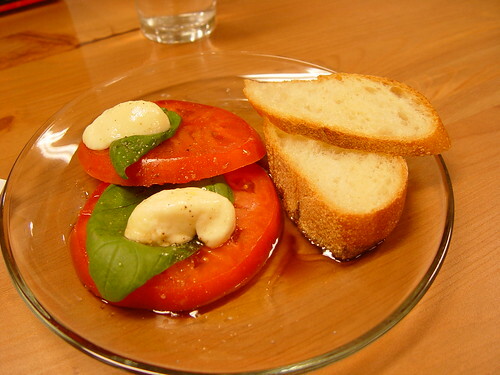 We enjoyed the demo batch of mozzarella with delicious tomatoes, basil, bread, olive oil, balsamic vinegar, and pepper!! 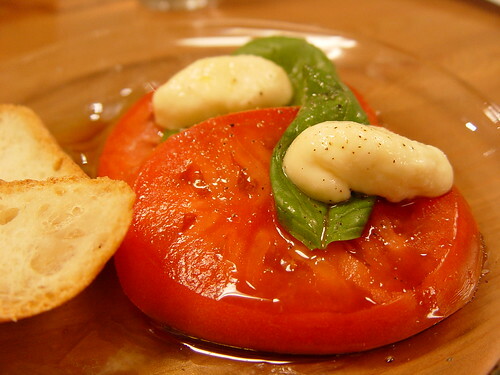 I need to price-check fresh mozzarella to see if it’s more expensive to make your own at home! 🙂 The Straus organic milk comes at $5/half-gallon, so I think it might be a wash. But it’s pretty fun and I could see myself doing it at home, especially since I have access to all the ingredients. Sacha was a wonderful, encouraging teacher, and I’m hoping I can find some fun money to spend on some of her other cheesemaking classes in the future. I don’t think i’d ever have the patience to do this. Thanks for the info. I tend to cheat and buy the curds then warm them up and put them in brine to skip a few steps, but I will try to do it from scratch one of these days. I find that the firmer balls work as a paneer substitute for indian food. Why do you need th elarge simmering pot of water at 185 degrees? I never saw where you used it… plan on making this – and am googling! Appreciate the info – but want more.